I was the last in the basket. 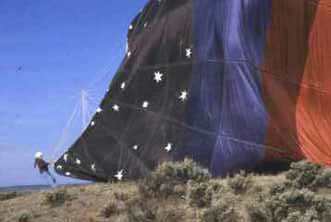 In a blink, the hot air balloon overcame gravity, rising like the mythical bird, Phoenix. Sensations were a blur -- the sound of rushing, fiery propane; the views of the promontory bordering the Rio Grande Gorge; the shouts from well-wishers below; the warmth of the suns first rays breaking over the 13,000 foot Sangre de Christo Range. Looking back on that personal inaugural balloon flight, it was like a dream where the real and surreal blend, leaving one to wonder if it really took place. Ive taken several flights since then and have concluded that the wonder, awe and dreamlike character of ballooning will be as strong for the 500th flight as for the first. Im pleasantly afraid that Ive succumbed to becoming a "balloonaholic." Hopefully, there is no cure. It began with an invitation to join a press trip sponsored by the Taos Chamber of Commerce. Participants could select an activity from a menu of adventures. Though llama trekking, horseback riding, rock climbing and river rafting were alluring, how often does one get a chance to ride in a hot air balloon? 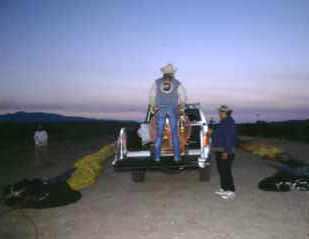 Four a.m. of flight day I awoke, anxious to make the launch site by 5:30 a.m. Both of Taos ballon companies, Paradise and Pueblo, were each launching a balloon that day. balloons lie alongside his pickup. As the passsengers arrived, the pilots and their crews wasted no time. A small, birthday-type pilot balloon, or piball, was released to check wind conditions of velocity and direction at various altitudes. It rose nearly straight up, with a slight drift toward the Gorge... Ideal. The FAA-licensed commercial balloon pilots top priority is safety. One hour is the average flight time for both companies, but a total of 3½ hours is scheduled to ensure rigorous and safe procedures with the ballons and their clients. Paradise and Pueblo both have spotless safety records. As we received instructions on the dos and donts of ballooning, Paradise pilot Dean Cowell commented, "Its safer than walking across the street. Its the safest form of aviation there is." The envelopes of pear-shaped balloon fabric, each weighing 240 pounds, were unpacked and spread on top of blue canvases. Each basket was attached to the envelope lines with carabiners. A cold air fan began blowing life into the flaccid envelopes with a crew member parting the envelope skirt lips on each side to direct the air flow. When half inflated, the fan was replaced with the first propane firings, flames shooting dragon-like breath into the envelope. During the entire procedure one crew member held taut the crown line, a long rope extending from the center of the balloons top. 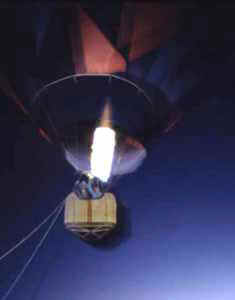 Simultaneously, the remainder of the crew stood the basket upright as the nearly inflated envelope rose toward the sky. The crown line crew member acted like a skidding brake until eventually releasing the line. Paradise pilot Cowell yelled above the hissing gas, "Hurry passengers, get in," and the three of us scrambled to join him in the four-person basket. We lifted off. Already in the air above us was Pueblo pilot Johnnie Lewis and his three passengers. 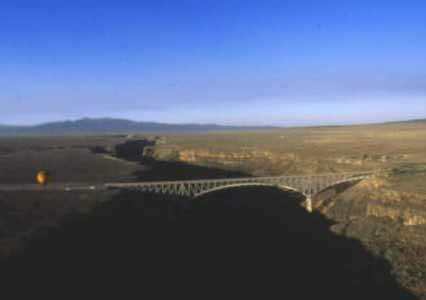 The Taos Rio Grande River Gorge flight is unique. The Gorge, an erosional 37-mile rift, averages 650 feet deep (800 feet at the deepest) and varies from 200 feet to one-half mile in width. The rim of the Gorge averages more than 7,000 feet in altitude. It is a dramatic high desert chasm that leaves passengers oohing and aahing the entire flight. This section of the Rio Grande is the nations first Wild and Scenic River. It is also famous for rafting, with a series of Class III and IV rapids. Bathed in the amber summer light of dawn, we dipped into the shadow of the Gorge. Descending into the Gorge for a Rio Grande River "splash and dash", where the balloon basket barely touches the water before again ascending, is an experience to exhaust all superlatives. We did just that under the master helmsmanship of Cowell. I was the only one to get my shoes wet. With two puffs of propane fire breath into the envelope, we rose above the water, coursing the river like a rising bubble. Ascending back into the light, we watched our balloons shadow travel ahead of us on the Gorges western basaltic wall. Traveling down the Gorges artery, we crossed directly over the impressive Rio Grande River Bridge. We watched Lewis flawlessly land his balloon on the bridges eastern parking zone. Ann is landing on the east end of the bridge. Cowell had piloted the air currents perfectly. We left the Gorge and started drifting westward over Indian lands. Cowell radioed his ground crew, alerting them to our projected landing. In the area where Cowell and Lewis fly, there are no power lines for 10 miles. "Power lines are bad for flying and landing, sagebrush is good," smiled Cowell. Gently he lowered the balloon. Soon we touched the tops of sagebrush, slowing our air speed. "Okay, hold onto the railing of the basket as we, one by one, lift ourselves out and back onto the earth." After our exit, the ground crew followed up, collapsing the balloon envelope to the ground for rolling, bagging, and storing on the trailer. Our flight lasted over an hour. "Pure heaven," said fellow passenger and Albuquerque writer Sue Mann. "I heard pilot Johnnie Lewis say an astronaut once told him that ballooning was the closest thing to walking in space. Wow...what a feeling." After our balloon was stored away to fly another day, crew chief Ken Eske brought out a bottle of champagne with glasses. At 9 a.m. everyone raised their glasses and Eske toasted, "Heres to gentle winds and soft landings." 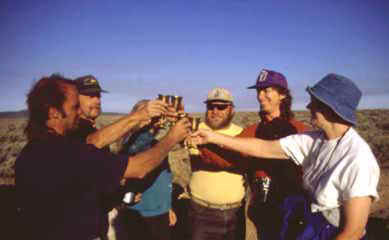 Pilot, crew members, and passengers toast to a successful flight. Down the dusty road we drove, back to the pavement and eventually to the launch site where a gourmet breakfast brunch, prepared by Lewis wife, Debbie, awaited us. Soon after, five of us were christened first-time balloonists in a humorous ceremony. 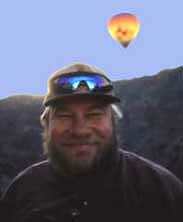 Two days later, I had the good fortune to fly with Pueblo Pilot Johnnie Lewis in his balloon, Maggie Ann. On this flight the prevailing winds didnt not allow us to slip into the Gorge. We flew east over mainly flat or slightly hilly, arid terrain. As we flew over a large gravel pit operation, first-time balloonist, sixty-five-year-old Houston, Texas passenger Peggy Corbutt pointed to the monstrous gravel mounds, asking Lewis what they were. "This is where they bury Texans," he answered. Everyone shared in the laugh. "Im absolutely overwhelmed," Peggy exclaimed. "Ive always had a fear of heights, but Ive always wanted to do this. For some reason, there is no fear from the basket of the balloon. Only awe." Pilot Lewis has flown 5,000 balloon hours throughout the world, including work for corporations, movies, and videos. National Geographic used his skills to photograph and map the Valley of the Kings in Egypt. "Of all the places Ive flown, the Taos area is tops," said Lewis. 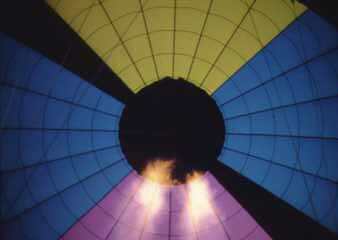 "It is a hidden mecca for ballooning. The only thing that would even compare would be the pyramids of Egypt." Lewis crew chief is Taos Pueblo Indian Louis Archuleta. "Louis is not only a hard worker, but he has taught me alot about the Taos Pueblo culture. And since we fly over and sometimes land on Indian land, he is the perfect liaison," said Lewis. Lewis is a balloon precisionist with a great sense of humor. "I get people to pay me to get them back down," he deadpanned. Nicknamed Merlin because of his long gray hair, always topped with a cowboy hat, the 52-year-old Lewis once took a balloon to 30,000 feet. He continued, "Every morning when I wake up, Ive been dreaming Im flying around the world in a balloon." ...Yes, balloonaholic! evening in Taos's Kit Carson Park. 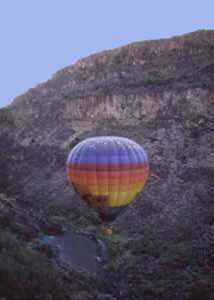 Click here for details to plan your own ballooning trip to Taos, New Mexico.